It wasn’t the black stripe each Boston Celtics player wore on the left side of his jersey. It wasn’t the moment of silence held at TD Garden before the game. It wasn’t even the game-high 33 points he fought through overwhelming emotions and tears to score. It was the shoes. All night long, in Game 1 of Boston’s first-round NBA playoff series against the Chicago Bulls on Sunday, the most important tribute Isaiah Thomas could give to his sister, Chyna, a day after she was killed at the age of 22 in a one-car accident in their home state of Washington was on his feet. “CHYNA R.I.P. Lil Sis” Thomas wrote on the left outsole of his vibrant green, black and gold pair of Nike Kobe A.D. sneakers. The words “CHYNA I Love You” were inked on the right outsole, and tucked inside of each shoe was “4-15-17,” the date Chyna died. Jersey numbers, Bible verses and, in many cases, the names of those who’ve passed away forever find their way onto the outsoles, heels and toes of shoes. Over the years, sneakers have increasingly become canvases of condolences for players in the NBA. 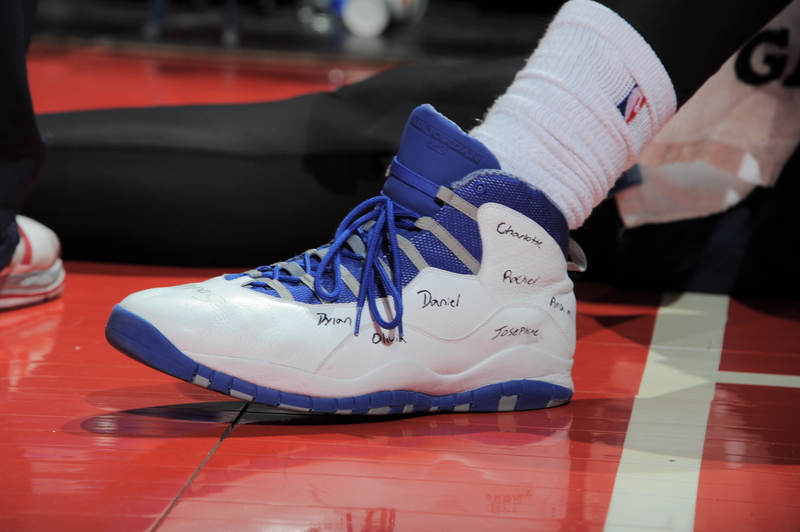 In 2013, on the one-year anniversary of the shooting at Sandy Hook Elementary in Newtown, Connecticut, Detroit Pistons big man Andre Drummond wrote the names of all 26 victims on his royal blue, gray and white Air Jordan 10s. 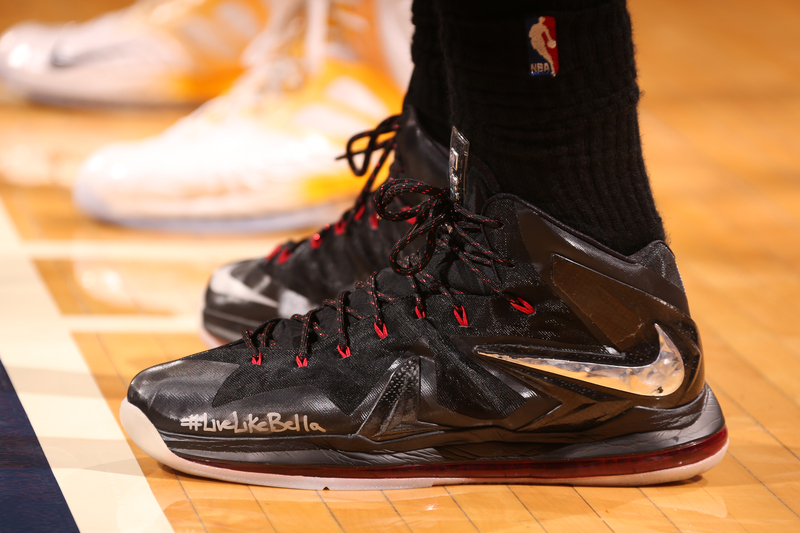 While they were teammates with the Miami Heat, LeBron James and Dwyane Wade remembered die-hard Heat fan Bella Rodriguez, who died of cancer in 2013 at the age of 10, with “#LiveLikeBella” in silver ink on each pair of their shoes. 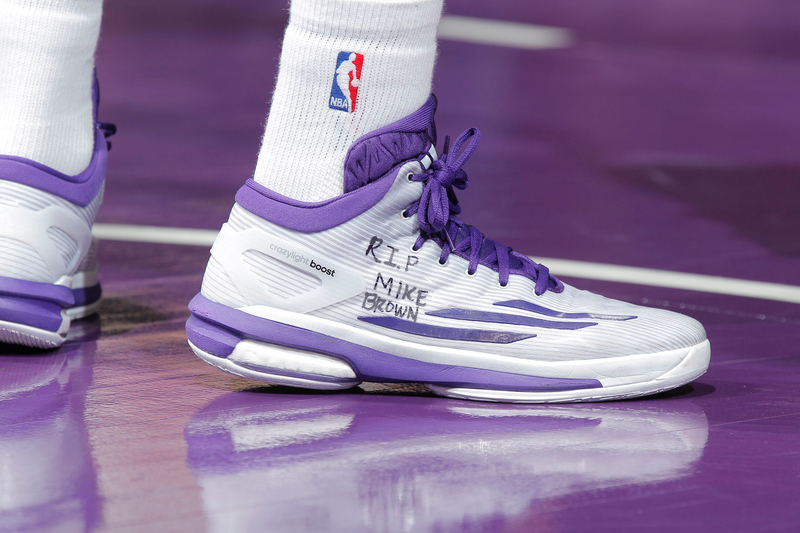 After Michael Brown’s 2014 shooting death at the hands of Ferguson, Missouri, Police Officer Darren Wilson, Sacramento Kings guard Ben McLemore, a St. Louis native, wrote “R.I.P Mike Brown” on a pair of Adidas Crazy Light Boosts. 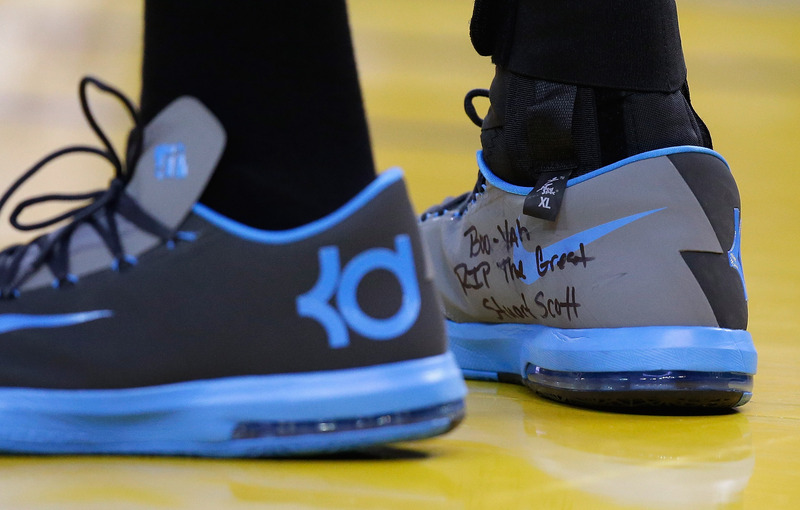 When Stuart Scott died of cancer in early 2015, Kevin Durant scribed the longtime ESPN broadcaster’s trademark phrase “Boo-Yah” above the words “RIP The Great Stuart Scott” on his own signature shoe, the Nike KD 6s. All of these examples illustrate players giving a voice to the voiceless in remembrance of people they barely knew or never got a chance to meet. Yet, in Thomas’ case, he was the voiceless, shaken by the loss of his blood sister before one of the biggest nights of his career. During Game 1, Thomas’ typically oozing, me-against-the-world personality was noticeably absent. In its place were the characteristics of a man deep in the early stages of grieving — glossy eyes, little to no smile, moments of unfocused lethargy. Leading up to the game, TV cameras caught Celtics guard Avery Bradley embracing a crying Thomas on the sideline, and during the moment of silence the arena observed for Chyna Thomas before tipoff, tears streamed down his face. “You wanted to talk to him, but you really can’t talk to him because he’s not talkative right now,” Celtics forward Jae Crowder told SB Nation’s Celtics Blog after Boston, the Eastern Conference’s No. 1 seed, fell 106-102 to eighth-seeded Chicago in Game 1. Thomas remembered Chyna through the words he penned on his sneakers. And in every step, crossover and shot he took, she was with him. The way Thomas spoke up was through his shoes: the special-edition Kobe A.D.s that only No. 4 of the Boston Celtics wears. In mid-February, Nike presented Thomas with the player exclusives (or PEs, as they’re referred to in the sneaker world) in honor of his second All-Star Game appearance. Since then, the Kobes have become Thomas’ go-to option for games. For the opening game of this year’s playoffs, Thomas again laced up the sneakers Nike designed to especially represent him. A double helix is embroidered on the heel of each shoe, symbolizing what’s envisioned as the 5-foot-9 point guard’s own DNA. But in the wake of Chyna’s death, Thomas needed his sister. So, he broke out a black Sharpie and customized the PEs more than Nike could’ve ever imagined. On this night, Thomas remembered Chyna through the words he penned on his sneakers. And in every step, crossover and shot he took, she was with him.